So was your guess in there? Did you have another idea we missed? Google is really committed to offering searchers quality, accurate and functional. They also care what it is that people offer where they’re offering it, and whether it’s legal to say/sell/claim/offer. 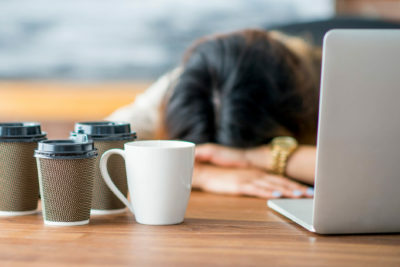 So they built out a set of learning modules (about 25-30 hours worth) and tests (which take another 10-15 hours) to train AdWords users on the who/what/where/when/why/are-you-serious/do-I-really-have-to and you’ve-got-to-be-kidding aspects of creating and running AdWords campaigns. At the end of this ordeal (which we have to do all over again Every. Single. Year.) 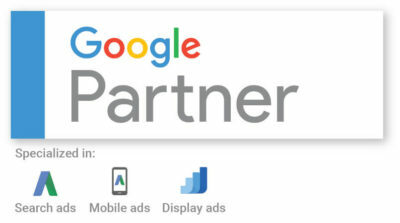 we get to display the Google Partner badge on our website. And honestly, as much as we whine and complain at re-testing time (trust us, you do not want to be around on those days! ), we’re pretty honored to earn the badge year afteryear. It means we’re current on the million and one changes Google has made over the past year. It means we’ve taken the time to review AdWords’ policies and procedures so we provide the best options for our PPC clients. And it also means we care enough to put in the work to learn and relearn, test and retest. Along with badge, earning it means that we have dedicated reps within Google who can answer questions, solve problems and keep us up-to-date on proposed and recent changes to policies. We even get to attend Partner-Only training sessions at Google, where we stock up on information and of course, lots of Google swag. A few more details before we go. You might notice that under the badge there are a few specialities like Search, Mobile and Display. While we are certified in all aspects of AdWords, including Shopping and Video ads, we are currently focusing most of our time on the specialties listed. So now you know. One small badge for RefreshWeb…one giant expenditure of time, eyestrain and review time for our staff. But hey, we think you’re worth it!